I can not do installation of the BMPN 2 plug-in in Eclipse. (I tried: OS - CentOS , Debian, Eclipse - 3.5 , 3.6, pre-instalation JBoss Tools). Anybody had a successfull experiences on Linux with BPMN 2.0 plug-in? my installation seems to work correctly, the BMPN2 modeller inclusive. However I use the installer provided by jBPM5. I not used a installer. My main system - CentOs 5.5. What version of eclipse are you use? 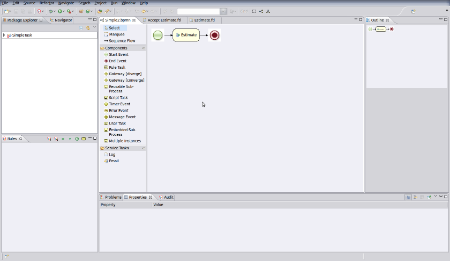 I through the menu Install soft - did instalation the JBoss tools, and after try install BPMN2.zip. But i not saw any jar files of plug-in in the Eclipse folders (plugin and features), and not saw the menu item BMPN diagram during creation files. But into the list of plugin the BPMN has status enabled . Strange. This is possible to do install of the plugin without jbpm5 installer? I/the installer uses Eclipse 3.6.1. I'm not eclipse expert, but from what I see from the ant build script, you need to download several files and extract them over eclipse installation. I am too, i prefer NetBeans. I did it, but unsuccessfully. Do you have in preferences of Eclipse - Installed JBPM Runtime? Have you tried to download all the components and extract them over the eclipse installation? It has to work. I did installation from jbpm intsaller. (BUILD SUCCESSFUL Total time: 60 minutes 28 seconds - quickly :-)) But i could not to install a BPMN2 plug-in from *zip. In manual i read: " A new BPMN2 Eclipse plugin is being created to support the full BPMN2 specification. It is currently still under development and only supports a limited number of constructs and attributes, but can already be used to create simple BPMN2 processes." Did you install the BPMN2 plug-in? I want work on pure BPMN 2 notation. Becouse in current notation i not saw of cyclic and other activity. Do you know, export from other BPM system into JBPM is possible ? I was able to setup the pure eclipse under current plug-in before. I was did comparision instalation from ant :-). Total time: 60 minutes 28 seconds - quickly :-)) But i could not to install a BPMN2 plug-in from *zip. I'm not sure, if you're looking for the same thing as I understand under "jBPM plugin"... I understand it as the BPMN2 process designer integrated into eclipse. The plugin requires quite a few other plugins to be installed (for graphical editing of your processes) before it will show up. In general, it is probably easier to use the installer to download and install everything you need (note that you can point it to your own eclipse installation so you don't need to download and reinstall that). I run the installer. After i tried to install the BPMN.2.0 (http://planet.jboss.org/post/eclipsing_bpmn_2_0). It was unsuccesfull. Why? I want use: the call external WS through partner links, cyclic construction (while, for each) . These features are included into BPMN 2 standart. This is possibly?